These awards will be presented at the NAPHA National Show in 2018. The winners will also be listed in our National Show Program. Congratulations to all of these fine horses, owners, breeders and riders for their extraordinary efforts in the show ring, on the trail, in exhibitions and parades! Champion of Champion title at the National show 3 times, in a specific division. a minimum of 3,000 show points in the qualifying classes during their show careers. a minimum of 3,000 show points in the Performance division during their show careers. number of show points in the show year in their respective category. This is an annual award presented to the performance gelding and performance horse who have earned the highest number of performance show points in their respective category. These awards are given to the highest performing Peruvian Trail Horse, Parade Horse, and Open Show Horse. 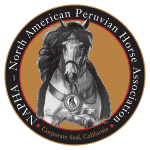 The horse must be registered with NAPHA and owned by an Owner Member in good standing with NAPHA, to be eligible for these awards.